I have decided not to buy any of the mixed bird seed this year after reading about the lawsuit against the Scotts Miracle-Gro company and the toxic pesticides they knowingly put in their wild bird seed a few years ago. They have since admitted that they coated their seed mixes with pesticides to protect the seeds during storage… and these were extremely toxic pesticides that they knew would kill the birds. They have also admitted that they lied to the government and consumers when they insisted the pesticides were safe. The company will pay a fine but that seems like a hollow punishment to me when you compare it to the number of wild birds and other wildlife that lost their lives because they ate this company’s poisoned seed. This, of course, explains why the wild bird population became almost non-existent at our feeder and so many other feeders across the country a couple of years ago. It makes me really angry that this company’s lack of caring and stupid lies put so many of us in a situation where we were actually poisoning the birds we were trying to help. Supposedly this company’s wild bird seed is now safe and non-toxic, but I wonder if that can be believed… especially since this company admitted that they continued to sell the poisoned seed even after they knew it would kill birds and other wildlife, and many stores selling this brand of seed also continued to sell it for up to two years after the seed had been recalled… even after they had been told it would kill the birds that ate it. I would guess that without knowing it we bought some of this recalled seed. We still have an almost full bag of this brand, a “premium” mix from this company, and I’m trying to decide how to best dispose of it so that nothing will ever eat it. One thing I can be sure of… I will not be buying more. A few weeks ago we put the feeder back up for the winter, filled it, and had birds in the feeder immediately. Apparently they have been watching and waiting. 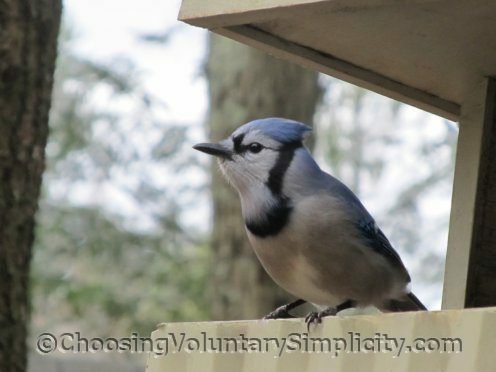 My husband had chickadees on his head and a bluejay landing on his arm before he even got the feeder upright. So far this year we are just feeding black sunflower seeds and the mix of pulses and seeds that is sold as pigeon food. I want to add some thistle seed if I can find any. We also put out suet, and it is a horrible piece of suet with a lot of tissue still in the fat, which makes the suet very pink. Unfortunately, it was the only suet we could find in the seven stores we called that usually have suet this time of year. It looks very unappetizing but the birds don’t seem to mind. I hope we will be able to find better later on. I especially enjoy the mourning doves. 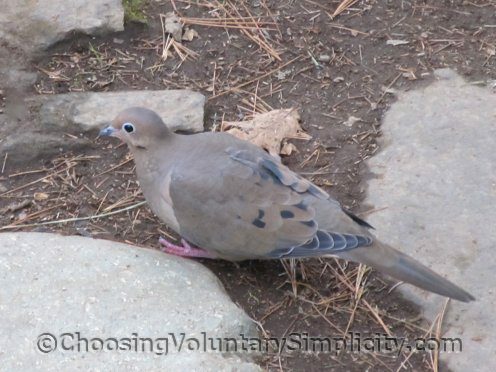 Many people think that mourning doves won’t eat at a feeder, but this is not true. 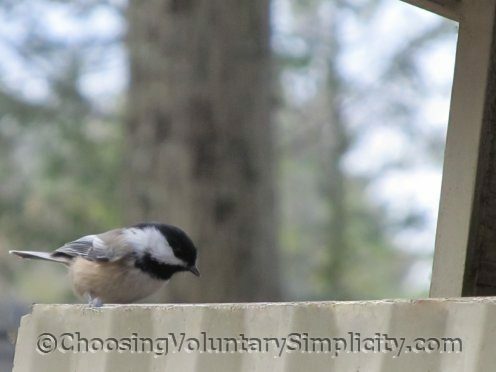 They will eat enthusiastically if the feeder has a large enough tray so they can walk instead of just perch. We often have up to sixteen doves around, on, and in the feeder all at once. There was only one dove the first day… an early adopter… first he checked out the sunflower seeds on the ground that had dropped out of the feeder and then flew immediately into the tray. After that first day we have had a crowd of doves every day. The pigeon food is especially for them, but the bluejays like it too. For the last couple of years it’s been against the law here to feed the birds during the warm weather months, and there’s a hefty fine for anyone caught leaving a feeder up after the end of April. We take our feeders down for the summer… I would prefer to feed the birds year round because it’s a great opportunity to see baby birds up close when the parents bring them to the feeder to be fed… but we have so many bears wandering around here, I suppose not doing anything to attract them makes a lot of sense. I wonder if this could have anything to do with all the birds falling out of the sky stories that we keep seeing on the news. What a terrible terrible thing for that company to do. I would have thought they were more ethical than that. I followed your links and read the news stories about what this company did. I am appalled. I am only glad they were caught. I really enjoyed your beautiful photos of the birds. I want to try feeding the doves. I was going to suggest you bury the seed but something could dig it up. If you burn it the pesticides will go out into the air. You won’t be able to put it in the tip because something will eventually get to it there. I wonder what the company suggests people do with any of this poisoned seed? Thanks for this article and for the beautiful bird pictures. Thanks for sharing that story; it’s the first I’ve read about it. I feed other brands of seed to wild birds, but all Scott’s products are now added to my “do not buy” list. Impossible to have confidence in a company that could ignore the warnings of their own employees. Even from just a financial perspective, if that is what such decisions are based upon, it is remarkably short-sighted of companies to delay doing the right thing, if only to protect their reputation in the marketplace. 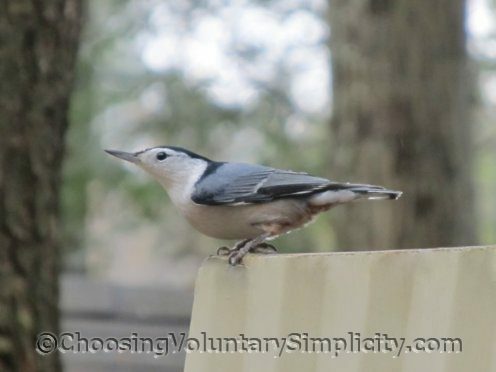 So what safe options do we have to feed the birds? I have always bought black oil sunflower seeds with sometimes some thistle seed on the side to feed the birds. The birds here just don’t seem to care for the bird seed mix and tend to pick out the few things they want and leave the rest. The cost of sunflower seeds has got so high recently that I have considered trying the mixed bird seed again. I’m so glad I haven’t! I have heard that the Scott company has some connections with Monsanto, at least in their bad reputation. Thank you for this information. I wish that I could say that I’m surprised, but I’m getting to the point where nothing surprises me anymore. Outrages, yes, but surprises, no. So sad. Have you considered growing cornflowers? They have lovely blue flowers in June. If you leave the seed heads the birds will love them, but not the bears. Also how about growing your own sun flowers, there is a lovely variety called “Vanilla Ice” with pale primrose yellow flowers. You can’t feed birds in the summer?? That is ridiculous! I don’t really see what the big deal is. I also can’t believe that Miracle Grow would knowingly do that. Makes me wonder what they are putting in that we are spraying gardens with. How do we know they won’t be killing humans.